Cartel Coffee Lab is a name I know well from my multiple visits to Phoenix, where I have visited many of its branches, including the flagship roastery/coffee shop in Tempe. I also make a point of calling in at the Sky Harbor Airport branch whenever possible, including when I flew out on Tuesday. However, the subject of today’s Coffee Spot is the first time I have ventured outside of Phoenix, at least when it comes to Cartel, calling in on its downtown Tucson branch when I was there last weekend. If you’re familiar with any of Cartel’s other branches, then you’ll know what’s on offer: six seasonal single-origins, all roasted in-house, one of which is decaf and another (the one on the top of the list) which is always available as espresso. Add to that a daily batch-brew and the pour-over option through the Chemex (8oz or 16oz), where you can choose from any of the beans, and you have a coffee-lover’s paradise. As usual, all the beans are available to buy, plus there’s craft beer and a range of cakes if you’re hungry. This is all served in a glorious, light-filled building which might be my favourite Cartel branch to date. Cartel Coffee Lab’s downtown branch, on the busy East Broadway Boulevard, is the most recent of its two Tucson branches, even though it opened six years ago! Under five minutes’ walk south of the Amtrak station, it’s a reasonable option for coffee if you’re waiting for your train, except that there are only two trains a day, one at 8:15 in the morning to Chicago/New Orleans, the other at 19:35 in the evening to Los Angeles… Fortunately, Cartel is open for both! It’s also on a major bus route, which, coupled with the trams, which stop one block away, make it easy to get to by public transport. Cartel occupies a single, large brick-built space open to the shallow A-frame roof. It’s full of natural light, but, due to its north-facing aspect, not too bright. There are two large, floor-to-ceiling windows along the front, plus a smaller one to the right and floor-to-ceiling, glass double doors on the left. There are more windows down the left-hand side (which catch the morning sun) plus a further pair of glass double doors at the back. Finally, the roof is punctuated on the right-hand side by regular skylights which catch the afternoon sun. The bulk of the plentiful seating is at the front, the space delineated by a large, irregular-shaped counter which occupies the back, right-hand quarter. There’s more seating back here on the left, which is slightly higher than the front, accessible via a small step or a gently-sloping ramp. There are two narrow three-person tables, each with barber-style chairs in the large windows at the front, with a more conventional four-person one in the smaller window to the right behind a wall made of bicycle wheels. Meanwhile, three long communal tables fill the remaining space to the counter. One is a wooden 10-person table, while the other two are made of four, fixed two-person tables on a central, metal frame. Just for variety, there’s a round, five-person table off to the left, with a six-person bar up against the wall just beyond it, a good option for laptops since there are plenty of power outlets. Up on a small step on the left, you’ll find two high, square four-person tables and two high, round, three-person ones arranged along the wall. These are opposite the counter, partially screened by the retail shelves. Beyond the doors, there’s a small one-person table against the back wall, while in the middle of the space at the back, there’s an interesting arrangement of three barber-style chairs, all facing outwards. The final seating is provided by a line of bar chairs along the left-hand side of the counter, although these are well back from the coffee-making part of the operation. 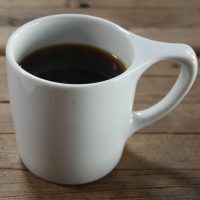 Having had the One & One when I was in Scottsdale two weeks earlier, I opted for a pour-over, following the barista’s recommendation of the Providencia Black Honey from El Salvador. Cartel now only serves pour-over via the Chemex, with 8oz and 16oz options available. Unsurprisingly, I opted for the 8oz, my coffee coming a single diner-style mug. It took a little while to grow on me, but as it cooled, it developed a lovely, subtle sweetness with fruity undertones. I paired this with a slice of the blueberry breakfast cake, continuing my long tradition of eating things at the wrong time of the day since it was 3pm. A sweet, slightly moist, cake with a crumbly consistency, it was really tasty. You can also see what I made of all the other branches of Cartel Coffee Lab that I’ve visited. This entry was posted in Cafe/Roaster, Cake, Cartel Coffee Lab, Coffee & Beer, Coffee Shops, Evening Opening, Laptop Friendly, Late Opening, Retailers, Tucson and tagged Cartel Coffee Lab, include, USA2019-01 by Brian Williams. Bookmark the permalink.